First, if you're interested in the work we do at the library garden or - more generally - in food and food-related matters, there's an informal meeting of like-minded folk tomorrow (Wednesday) evening, 8.00p.m., at The Royal to consider future activities of our 'food group'. Everyone's welcome, even if you've not been involved before. Ask for Ellen Bennett on arrival, and join the chat. If you can't make it but are interested please let Ellen know (ellenkbennett@yahoo.co.uk or on 07742 968436) know and she'll keep you in the loop. 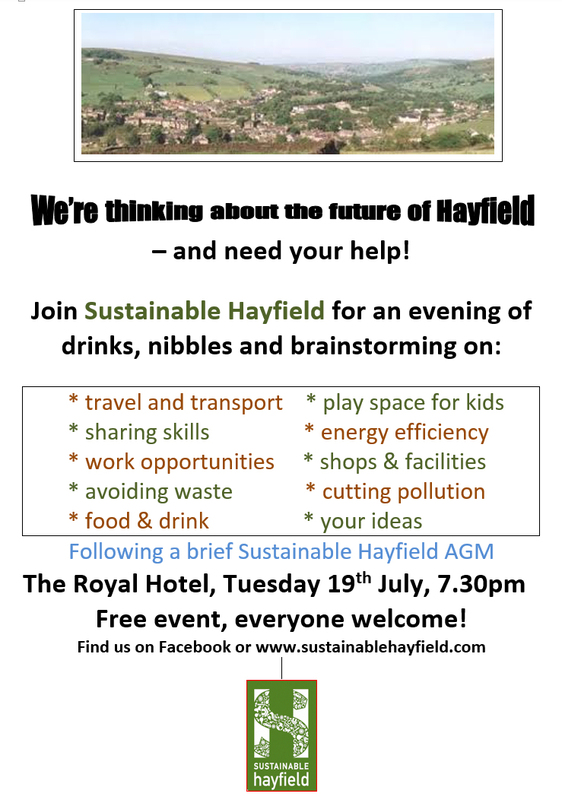 Second, a reminder about our open evening next Tuesday, 19th July (from 7.30p.m., again at The Royal) when, after our very brief AGM, we'll be considering what we can and should do to help make Hayfield a more sustainable community. We'll be looking ahead, with the involvement of everyone present, at some possible priorities for Sustainable Hayfield activity in the near- and medium-term future. We're really keen to hear ideas you may have about what we can do and, from discussion, identify a few areas we can and should focus on. There'll be a short film clip to show and some drinks and nibbles to help things along. Everyone's welcome, so - if you've some thoughts about what we should be doing, or just want to get a bit involved with what we do - come along. We hope to see you there! Please find attached our summer newsletter, packed with the usual goodies, information and ideas. We hope you enjoy it. WHAT’S 19TH JULY ALL ABOUT? A JUICER – FOR FREE! Can we draw your attention to the front cover and brief note on page 2 concerning our forthcoming event, Tuesday 19th July at The Royal, starting at 7.30p.m.? We'll have our AGM (takes about 15 minutes) and then we'll move on to an exercise in getting folks' ideas about what a sustainable Hayfield might look like (what we want to see, what we need to do etc.). It's a real opportunity for interested supporters to bring ideas, share them, respond to others', to help guide our future actions. We'll provide some drinks and nibbles to keep things well-oiled. There should also be a short film. We do hope you'll join us, and join in. See you there?